This tennis games glossary is divided into 3 parts that includes an introduction and a learning games section for new tennis players and fans. Tennis games glossary is dedicated to passionate game players and fans. Tennis became popular in the 19th century among the high society in England as a lawn game. Tennis is a game played between two individuals or two teams of two players on a field or court with a net placed between to separate the sides. A hollow ball, typically made of hard rubber and covered in a type of felt, is used and hit back and forth across the net with paddle-like racquets that are strung to hit the ball into their opponents half of the court. Tennis courts were traditionally made of grass but can also be made of clay or some other type of hard surface such as concrete or asphalt and occasionally even carpet in the case of indoor tennis. Ace: a serve that is in bounds on the opposing player's side of the net that goes untouched, resulting in a point awarded. A smooth move! Ad Court: the side of the court to each player’s left. Advantage: a point more than deuce in a tie game, giving the player that scores it the advantage and positioning him/her one point from winning. Advantage in: jargon for server advantage. Advantage out: refers to receiver advantage. All: scoring term for a tie, example 40-all. All-court: a type of play encompassing many different playing styles. Alley: the outer sidelines on the court between the singles and doubles sidelines. Approach Shot: a shot close to the net, typically with spin on the ball. Australian Formation: in doubles tennis, the strategy of both players playing the same side of the court prior to start of the point. Backcourt: court area from service line to baseline. Backhand: hitting the ball with the traditional back of the racquet. Backspin: a shot in which the ball has a reverse spin on it upon contact caused by hitting the ball in an upward slicing motion. Backstop: term for area behind the court end where tennis balls are held. Backswing: the part of the swing where the player’s arm is making a backward motion in order to build momentum to return the ball. Bagel: tennis games glossary term for the “O” that represents a bagel in a 6-0 win or a 0-6 loss. 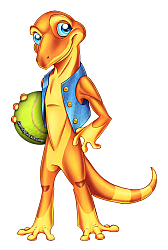 Ball boy or Ball girl: male or female given the task of chasing the balls during a match. Ball toss: occurs before executing a serve. Baseline: the end boundary stretching the width of the court. Baseline Game: method of play where most shots are near the baseline. Baseline Judge: game official who duties are calling the shots in or out. Baseline Player: term for player utilizing a baseline method of play. Big Serve: lingo for a powerful serve usually in a clutch situation. Faster than a speeding bullet! Block: typically a service return, the act of using the racket to block the ball, rather than hit it. Breadstick: slang for the shape of the 1 in a 6-1 win or loss. Break: the winning of a game when player is not the server, hence the breaking of the serve. Break Back: jargon for a successful receiver play after a service break. Break Point: one point away from the end of the match. Buggy Hit: the act of hitting the ball with no follow through but a short whip-like motion. Bye: occurs when top players qualify to advance without playing a match. Call: the umpire's decision to rule on a play during a match. Cannonball: lingo for a hard serve usually on a flat trajectory. Carry: illegal action where the ball is held/carried as opposed to hitting the ball. Carve: a groundstroke hit with spin on it. Center Court: premium seating location for the tennis court venue. Centerline judge: game official who is responsible for monitoring and calling the center service line. Center Mark: term for baseline midpoint that is 2 X 14 inches. Center Service Line: marks the boundary for both service courts. Chair: tennis games glossary for the location of the game umpire. Changeover: the time when players switch ends of the court between matches. Chip: a shot with under spin that is typically a block. Chop: jargon for tennis shot struck with a rapid downward action, having plenty of backspin. Whoa, that's a spinner! Clean Winner: tennis shot that the opposing player is unable to reach and play. Closed Grip: motion where the racket face is point down. Closed Racket: jargon for a racket held with a closed grip. Closed Stance: hitting the ball with your back turned to your opponent and your body parallel to the baseline. Court or Tennis Court: measures 78 feet X 27 feet wide for singles and 36 feet wide for doubles with a net in the middle. Service lines are marked 21 feet from each side of the net and parallel to it. Crosscourt: a shot that travels diagonally into the opponent's side of the court. Cut To: quick, slicing downward movement resulting in sideways and backspin. Cyclops: a computer powered device used to determine if a serve is in bounds or out. 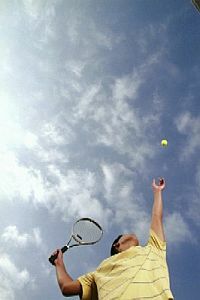 Much more than toss, hit ball with racket, the game of Tennis offers plenty of excitement and action. The Tennis games glossary in 3 parts defines the game that is often faster than a speeding bullet!